My Last 20 Years in the Scene… and What’s Next? REWIND THE CLOCK 20 YEARS AND YOU’LL FIND AN 11-YEAR-OLD VERSION OF ME IN HIS BEDROOM FLOOR WITH HIS FAVORITE HOT WHEELS MAKING ENGINE REVVING NOISES. Back then I was merely a dreamer thumbing through the pages of my favorite truck publications. 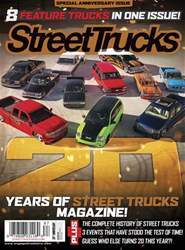 Never in a million years did I think a truck of mine would grace the pages of any of those magazines, much less land on the cover.